Above: This 1913 map (click to enlarge) shows the old road between Macclesfield and Buxton, running through Derbyshire Bridge. It also shows many coal pits and trial holes. Above: This photo shows the Macclesfield Old Road as it snakes from The Cat & Fiddle pub (about 1/4 mile to the left), through Derbyshire Bridge, and over the horizon towards Buxton. It’s just possible to make out the narrow road from Derbyshire Bridge to Goyt’s Bridge, running horizontally to the left. I’m not 100% sure, but I think the inset photo shows Moss House; one of four homes on this short stretch of bleak and windswept road. The roofline and chimneys certainly seem to match. I don’t have more photos or information on any these houses, beyond their names on a map (see left). 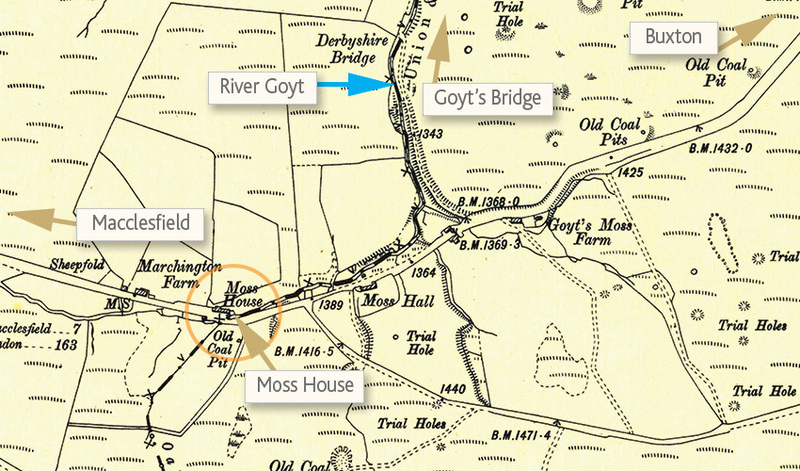 Marchington Farm is on the far left, then Moss House (cycled), Moss Hall (in the dip), and finally Goyt’s Moss Farm. There’s very little left of any of these houses, beyond a few dressed stones lying scattered on the ground, fast vanishing beneath the moorland vegetation. Although there is now a Peak District Rangers’ hut where Goyt’s Moss Farm once stood, with a small car park alongside. A look at the old OS map shows there was once a number of coal pits around here. And this may well be the reason why four relatively substantial, stone-built houses once stood here, providing shelter and accommodation for the miners and their families. My thanks to Mike for providing the census records below.